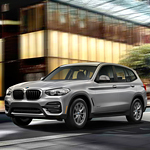 Hiking gear, backpacks, and coolers are just some of the items that you can load in the BMW X3's cargo area. Thanks to the split folding seats, the cargo zone has a 62.7-cubic feet storage capacity. If needed, you can tow a boat or a few off-road vehicles using the X3 by taking advantage of the included trailer hitch. When you press the accelerator, the BMW X3 won't struggle while it's attached to a heavy trailer. Instead, the vehicle will gradually climb to the desired speed using its power engines that produce 355 horsepower. Global Imports BMW is one of the best places to check out this appealing vehicle. If you buy it, you can journey to great places with all of your favorite outdoor items.